The Epoch Times was started in 2000 by a group of Falun Gong practitioners; the founders said they were responding to censorship inside China and a lack of international understanding about the Chinese repression of Falun Gong. In May 2000, the paper was first published in the Chinese language in New York, with the web launch in August 2000. By 2003, The Epoch Times website and group of newspapers had grown into one of the largest Chinese-language news websites and newspaper groups outside China in the past two years, with local editions in the U.S., Canada, Australia, New Zealand, Japan, Indonesia, Taiwan, Hong Kong, and major Western European countries. The first English edition launched online in 2003, followed by the New York print edition in 2004. In 2000, 10 of The Epoch Times correspondents were imprisoned in China, but current staff of the Chinese-language edition work in Hong Kong. As of February 2012, 67 The Epoch Times newspaper editions are published in print on 5 continents. They are available in 11 languages and have a distribution of 1,315,000 copies in 35 countries. Distribution varies from daily to monthly. The Epoch Times is available in 21 languages on the internet. In Chinese there are websites for Hong Kong, Taiwan and Australia as well as the main Chinese website. The Epoch Times receives 105 million page views per month from 20 million visitors. Reporters cover stories that pertain to their own areas, contributing to a pool of articles for the different editions to share. English The English language edition of The Epoch Times started in September 2003 as a website, and went to print in New York in August 2004. It is now published in the United States, Canada, Australia, the United Kingdom, Ireland, Singapore and Malaysia. Chinese The oldest of The Epoch Times editions, the Chinese paper has been in operation from May 2000, with the web launch in August 2000. The Chinese edition of The Epoch Times (Dajiyuan) is now the single largest Chinese language newspaper in the world, covering 35 countries across North and South America, Europe, Australia, New Zealand and Asia. French The French edition launched as a website in January 2005, and went into print shortly after. La Grande Époque is found in France, Canada (Montreal, Quebec province) and Switzerland since 2005 and changed its name for Époque Times in Quebec in 2012. Spanish The Spanish website of La Gran Epoca launched in early 2005. Circulation of the print edition began in Argentina one week before the website went live. German The German website of The Epoch Times Deutschland launched in late 2004. The printed edition in Germany and a few neighboring countries, as Die Neue Epoche, was halted in 2012. Russian The Russian language edition started in December 2004 as a website, and later it went to print in St. Petersburg. The Russian newspaper is now distributed all over Russia. Ukrainian The Ukrainian website of Велика Епоха (or Epoch Times) launched in May 2005. In March 2006, the bilingual Ukrainian and Russian edition (www.EpochTimes.com.ua) of the Ukrainian site was launched. Bulgarian The Bulgarian edition started in mid-February 2005, with a Bulgarian version of the "Nine Commentaries". Hebrew The Hebrew edition started in December 2005. It is printed weekly and is mainly distributed in Tel Aviv. Slovak The Slovak edition started on 1 March 2006. Czech The Czech edition started on 6 October 2006. Turkish The Turkish edition started on 9 June 2011. Portuguese The Portuguese edition of started on 18 April 2012. The core team is based in Brazil, with a satellite office in Portugal. Italian The Italian language edition website launched in December 2012. Persian The Persian edition launched on 12 January 2013. This edition serves those speaking Persian in Iran, Afghanistan, Tajikistan, and other countries. The Epoch Times dispenser at Huntington metro station, near Washington, D.C. The Epoch Times' flagship New York edition is typically around 50 pages, divided into four sections. Section "A" is primarily devoted to current events, with several pages devoted to China issues and politics. Section A also includes opinion pages, sports, science & technology, business and real estate. Section "B" is Arts & Culture—covering classical art forms, exhibits and events. Section B also includes Style and an "Essence of China" page devoted to traditional Chinese culture, stories, and art forms. Section "C" focuses on health and fitness featuring mainstream medical science, alternative and Chinese medical treatments. Section "D" is Food which focuses on cooking and local restaurants. 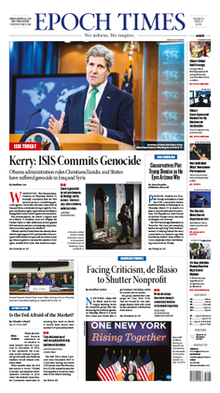 Outside of New York, other English editions typically take the form of a 16–24-page broadsheet. The content is a shorter version of the New York edition, with a focus on each edition's local region. Print editions range from 30 to 80 pages. A typical print edition includes sections on local and national news, China, world, health, science, autos, real estate, arts & culture, style, home, food, dining and special sections covering traditional Chinese culture & values. According to the Canadian Circulations Audit Board, The Epoch Times is the first and the only Chinese-language daily newspaper in Canada to complete a circulation audit. English The Epoch Times chair Stephen Gregory said in 2007: "It's not a Falun Gong newspaper. Falun Gong is a question of an individual's belief. The paper's not owned by Falun Gong, it doesn't speak for Falun Gong, it doesn't represent Falun Gong. It does cover the persecution of Falun Gong in China." Associated Press reporter Nahal Toosi wrote that it is "technically inaccurate" to say that the Falun Gong organization owns The Epoch Times. However, many of the newspaper's staffers are Falun Gong practitioners. Toosi noted that "many observers" have said that Falun Gong uses the newspaper as part of a public relations campaign. In March 2006, The Epoch Times published the allegations of three Chinese individuals who said that thousands of Falun Gong practitioners had been killed to supply China's organ transplant industry, including a doctor, who said there were 36 concentration camps all over China. Kilgour-Matas report stated "the source of 41,500 transplants for the six year period 2000 to 2005 is unexplained" and "we believe that there has been and continues today to be large scale organ seizures from unwilling Falun Gong practitioners". Appendix 16 of the revised report refuted Harry Wu's negative comments. In 2008, two United Nations Special Rapporteurs reiterated their requests for "the Chinese government to fully explain the allegation of taking vital organs from Falun Gong practitioners and the source of organs for the sudden increase in organ transplants that has been going on in China since the year 2000". The Chinese government has consistently denied the allegations. The parliaments of Canada and the European Union, Taiwan, as well as the Foreign Affairs Subcommittee of the U.S. House of Representatives, have adopted resolutions condemning organ harvesting from Falun Gong prisoners of conscience. During the 2009 New York City Comptroller elections, The Epoch Times alleged that Taiwan-born Democratic nominee John Liu is part of a "United Front" by the Chinese Communist Party to infiltrate the United States and subvert its government, democracy, and human rights in general. The newspaper alleged that "the CCP works tenaciously and systematically to place its people [...] in key positions in corporations, academia, and government in the United States and other countries." The Epoch Times also published an 8-page "special edition", and also featured on its website a section focused on coverage of Liu's reported ties with CCP officials. During Hu Jintao's visit to Canada in June 2010, the Toronto Star noted that The Epoch Times had published several "hard-hitting" critical stories on Hu's visit, such as allegations of the local Chinese embassy's orchestration of welcome parades, as well as an alleged recording of a speech by the first secretary of education Liu Shaohua, in which Liu stated that embassy would provide accommodation and transport for over 3,000 participants in the welcome parade. Canadian media reported that the parliamentary press office made deliberate arrangements in relation to Hu's public appearances limiting The Epoch Times' access to the General Secretary of the Communist Party of China, even though the newspaper is an accredited member of the Canadian Parliamentary Press Gallery. The paper carried an exclusive interview with outspoken Canadian Member of Parliament Rob Anders, wherein Anders alleged that the Chinese government used gifts and business deals in attempts to influence Canadian political decisions. The editorial stance of The Epoch Times is generally considered anti-communist, specifically opposing the Communist Party of China. In recent years, the newspaper's German edition has aligned with the German far right, and the U.S. edition has favored the Trump administration. The newspaper counters what it considers to be Chinese Communist Party propaganda through its own opinion pieces and reporting. The newspaper covers causes and groups opposed to the CCP, including Falun Gong, dissidents, activists, and supporters of the Tibetan government-in-exile. The paper also reports on Falun Gong-related news, including the group's attempt to sue former Communist Party general secretary Jiang Zemin under civil legislation for genocide, not covered by most other overseas Chinese-language newspapers. The newspaper is also at odds with the Taiwanese owned newspaper World Journal, accusing it of being a "megaphone for the evil Chinese Communist Party". The Epoch Times is well known for alleging conspiracy by former Communist Party general secretary Jiang Zemin, under whose administration the Falun Gong was prosecuted. It also often publishes Pseudoscience including but not limited to UFOs and chemtrails, in a section titled "Beyond Science". The section includes such articles as "12 Million-Year-Old Vehicle Tracks", Sumerian spaceships, hype over meditation, and near-death experience. The paper has published articles questioning the validity of widely accepted scientific results such as evolution and climate change. In 2005, the San Francisco Chronicle reported that "three new U.S-based, Chinese-language media outlets that provide provocative reporting about the Communist Party, government oppression and social unrest in China [namely The Epoch Times, Sound of Hope, and NTDTV] have ties to the Falun Gong spiritual movement." When interviewed, executives at each outlet said they did not represent the Falun Gong movement as a whole. The Epoch Times also runs mainstream newswire stories and in some places can resemble a community newspaper. According to sociologist Zhao Yuezhi, "While mainstream newspaper typically treat Web versions as an extension of the already-existing print version, The Epoch Times website serves as the master for all its worldwide papers." In some cases The Epoch Times operates in a hostile overseas environment, in which "overseas Chinese media companies choosing to remain independent or publish non-approved content become the targets of an aggressive campaign of elimination or control." In one instance Chinese diplomatic officials made threats against media for reporting Falun Gong-related content; in other cases, advertisers have been regularly threatened not to support The Epoch Times in any way. Communist Party authorities have been accused of resorting to "militant methods" against the newspaper and its staff, including attacking staff and destroying computer equipment. The newspaper reported that in 2005 the Communist Party "exerted hard and soft pressure" on printing houses in Hong Kong, forcing the paper to stop printing, after it reported on Tibet, human rights, Falun Gong, and was the first media to break the story on SARS. The newspaper was also briefly banned from Malaysia after coming under reported pressure by the Chinese Communist Party. The German edition of the newspaper, The Epoch Times Deutschland, which became Web-only in 2012, is aligned with the German far-right, attracting readers supportive of the Alternative for Germany (AfD) party and the anti-immigrant group Pegida. Since November 2004, the Chinese version of The Epoch Times has published and promoted a series of editorials and a booklet titled "Nine Commentaries on the Communist Party" (traditional Chinese: 九評共產黨; simplified Chinese: 九评共产党). The editorials expose the CCP's often violent political campaigns through its history, from its ascent to power under Mao Zedong to its present-day form. The CCP was criticized as an illegitimate institution which used underhanded tactics to gain power. The commentaries allege that the CCP "destroyed traditional Chinese culture" and brands the CCP an "evil cult". According to Ownby, the Commentaries are a condemnation of Communism and direct indictment on the legitimacy of the Chinese Communist Party in ruling China. While acknowledging the "unnecessary violence" the Chinese Communist Party has inflicted, as a professional historian Ownby finds that the lack of balance and nuance in tone and style makes the editorial resemble "anti-Communist propaganda written in Taiwan in the 1950s." The commentaries won an award in 2005. The Nine Commentaries have been translated into more than 30 other languages and released as a DVD. The Nine Commentaries have been credited by the newspaper and prominent leaders of the expatriate Chinese community, with sparking an exodus from the CCP and its affiliated organizations. The website of The Epoch Times hosts a "CCP Renunciations" service, encouraging Chinese to quit the CCP and related organizations. The number of people who have resigned from the Communist Party of China or its affiliate organizations, is published in Chinese editions of the newspaper. The counter stood at over 320 million on December 4. 2018. According to Ming Xia, political science professor at the College of Staten Island, The Epoch Times represents part of Falun Gong's effort to expand to non-practitioners, and "is part of the Falun Gong strategy to embed itself into the large civil society for influence and legitimacy". In his 2008 book on Falun Gong, David Ownby wrote that the The Epoch Times articles are "well written and interesting, if occasionally idiosyncratic in their coverage." According to Ownby, the newspaper has been praised and also criticized for a perceived bias against the CCP, and support of Falun Gong practitioners and other dissidents such as Tibetans, Taiwanese independence advocates, democracy activists, Uyghurs and others. The paper, therefore, is often assessed in light of its connection to Falun Gong, rather than a thorough analysis of its editorial content. James Bettinger, a professor of Communications at Stanford University and the director of the John S. Knight Journalism Fellowships, said "Even if Epoch Times is not associated with Falun Gong, if they consistently write about Falun Gong in the same perspective, or if there are no articles examining Falun Gong, people would perceive it as being not credible." Orville Schell, dean of the UC Berkeley Graduate School of Journalism, said in 2005 that "It's hard to vouch for their quality because it's difficult to corroborate, but it's not something to be dismissed as pure propaganda." Jiao Guobiao, a former Beijing University journalism professor who was dismissed after criticizing the Central Propaganda Department, proposed that even if The Epoch Times published only negative information highly critical of the CCP, the weight of their attacks could never begin to counterbalance the positive propaganda the party publishes about itself. In addressing media balance, Jiao noted that the Chinese public lacked negative, critical information regarding their country. As such, he noted for a need of media balance based on the principles of freedom, equality, and legality, and that media balance "is the result of the collective imbalances of all". The paper has also been lauded by some political commentators and media experts. Ethan Gutmann of the Foundation for Defense of Democracies, a neoconservative think tank, has characterized The Epoch Times as a leader in political analysis of the Chinese regime, writing: "With the "Chinese Regime in Crisis" series, Epoch Times has finally and indisputably arrived. Any China expert who wants to save face by pretending the paper doesn't exist can continue to do so—for a little while anyway—but they had better be reading it in secret." The Epoch Times has been criticized by some scholars for biases, particularly regarding the Chinese Communist Party and mainland China issues, as well as for being a "mouthpiece" of the Falun Gong movement. James To, a New Zealand political scientist, described the The Epoch Times as the "primary mouthpiece" of Falun Gong, writing that it "lacks credibility", despite the newspaper posing a "viable threat to the CCP" by publishing articles about the party's negative aspects. In his book Blocked on Weibo: What Gets Suppressed on China's Version of Twitter and Why, University of Toronto research fellow Jason Q. Ng referred to the paper's coverage of mainland China issues as "heavily biased against the Communist Party" and thus its reportage "should be viewed skeptically." In 2010, The Epoch Times successfully defended its reporting in the Canadian court system, when a publisher it had reported on, Crescent Chau of Les Presses Chinoises, sued for libel. The Supreme Court of Canada ruled that The Epoch Times article expressed "legitimate concerns and constitute an opinion which is drawn from a factual premise." In examining the case, John Gordon Miller, a Canadian journalist and media professor, noted that articles in question "appear to be thoroughly and professionally reported". Hayes Brown of Buzzfeed News called The Epoch Times "one of the staunchest defenders of Donald Trump’s presidency." The web-only, German edition of the paper, Epoch Times Deutschland, has been criticized by media analysts[who?] for its favorable coverage of far right populist groups such as the Alternative for Germany and Pegida, both of which proclaim anti-immigrant views, and promotion of skepticism towards mainstream German media and politicians. A German media report described the outlet, along with Sputnik News and Kopp Report, as a "favorite" of Pegida supporters, and found that its articles critical of immigration have been shared almost daily. 2012 Queen Elizabeth II Diamond Jubilee Medal – Canadian publisher Cindy Gu of The Epoch Times was one of about 60,000 recipients awarded this commemorative medal, which honors "significant contributions and achievements by Canadians." She was nominated for the medal by the Canadian Centre for Abuse Awareness for raising awareness of human rights abuses in China and the organ harvesting of Falun Gong practitioners. 2012 National Ethnic Press and Media Council Award – The Chinese edition of The Epoch Times was one of nine newspapers given an award for "excellence in editorial/free expression, best concept and visual presentation." 2012 New York Press Association Award – The Epoch Times won first place in the category "Best Special Section—Advertising, Division 2" for a special section produced for Asia Week New York in March 2012. "A great special section has five strong components: a great cover, appealing design, good art, strong content, and well designed complimentary advertising. This section has all five," said the NYPA judges. "In all, this is one of the nicest sections I have ever seen produced by a newspaper." 2012 Society of Professional Journalists' Sigma Delta Chi Award – The Epoch Times China reporter Matthew Robertson won this award in the category of Non-Deadline Reporting in newspapers with a circulation of less than 50,000 per day, for a series of articles he wrote on forced, live organ harvesting in China. 2013 Newswomen's Club Award – The Epoch Times New York reporter Genevieve Belmaker won a Front Page Award from the Newswomen's Club of New York for reporting about the impact of Hurricane Sandy, in the category of newspapers with a circulation of less than 100,000 per day. ^ BETSY MORAIS. "The Epoch Times doesn't like to brag". Retrieved December 23, 2016. ^ "Falun Gong Fields Media Weapons". Wall Street Journal. April 14, 2004. ^ Thomas Lum (August 11, 2006). "China and Falun Gong" (PDF). Congressional Research Service. Archived from the original (PDF) on February 5, 2012. ^ a b c d Hua, Vanessa (December 18, 2005). "Dissident media linked to Falun Gong / Chinese-language print, broadcast outlets in U.S. are making waves". San Francisco Chronicle. Retrieved December 9, 2006. ^ Peter Schworm (December 3, 2007). "Chinese-American activists decry China's communism". The Boston Globe. ^ a b Gossett, Sherrie (June 15, 2005). "Independent Chinese Newspaper Bucks Communists". aim.org. Accuracy in Media. Retrieved October 19, 2013. ^ Ownby 2008, p. 223. ^ "Epoch Times Marks 10 Years in Canada". Epoch Times. March 17, 2011. Retrieved July 25, 2013. ^ "The Epoch Times E-Paper". Retrieved April 30, 2013. ^ "Media Associations – Media Information on Canadian Circulations Audit Board". Cardonline.ca. Retrieved March 6, 2014. ^ "Epoch Times Canada's First Audited Daily Chinese Newspaper". The Epoch Times. Retrieved April 30, 2013. ^ a b c "Paper denies representing Falun Gong". Washington Post. Retrieved December 4, 2015. ^ a b Tong, Clement (2015). "Western Apocalyptic Narratives in the International Arena". In Jean-Guy A. Goulet; Liam D. Murphy; Anastasia Panagakos (eds.). Religious Diversity Today: Experiencing Religion in the Contemporary World. 3. ABC-CLIO. p. 71. ISBN 9781440833328. ^ a b Ownby, David (2008). Falun Gong and the Future of China. Oxford University Press. p. 223. ISBN 9780199716371. ^ Ownby, David (2008). Falun Gong and the Future of China. Oxford University Press. p. 8. ISBN 9780199716371. ^ a b c Ownby 2008, p. 221. ^ Couldry, Nick; Curran, James (September 22, 2003). Contesting Media Power: Alternative Media in a Networked World. Rowman & Littlefield Publishers. ISBN 9780742575202. ^ a b c Groot, Gerry; Stafford, Glen (2012). "China and South Australia". In John Spoehr; Purnendra Jain (eds.). The Engaging State: South Australia's Engagement with the Asia-Pacific Region. Wakefield Press. p. 103. ISBN 9781743051573. In related vein, another paper with wide distribution but published elsewhere is The Epoch Times (Dajiyuan shibao), the qigong meditation religious group Falun gong mouth-piece, which runs a strong anti-communist line. ^ a b c d Thornton, Patricia M. (2008). "Manufacturing Dissent in Transnational China". In Kevin J. O'Brien (ed.). Popular Protest in China. Harvard Contemporary China. 15. Harvard University Press. pp. 199–200. ISBN 9780674041585. ^ a b James Jiann Hua To (2014). Qiaowu: Extra-Territorial Policies for the Overseas Chinese. Brill. p. 97. ISBN 9789004272286. ^ a b Denton, Kirk A. (2011). "Yan'an as a Site of Memory". In Marc Andre Matten (ed.). Places of Memory in Modern China: History, Politics, and Identity. Leiden Series in Comparative Historiography. 5. Brill. p. 268. ISBN 9789004219014. An article in the anti-Communist, Falun Gong Epoch Times claims, without citing any sources, that Zhang's death was the result of an accident involving opium use. ^ Rod McGuirk (November 21, 2016). "Lawyers take Chinese organ-harvesting claims to Australia". Associated Press. Archived from the original on December 20, 2016. Retrieved 20 December 2016. ^ Ileana Ros-Lehtinen (June 25, 2015). "H.Res.343 – Expressing concern regarding persistent and credible reports of systematic, state-sanctioned organ harvesting from non-consenting prisoners of conscience in the People's Republic of China, including from large numbers of Falun Gong practitioners and members of other religious and ethnic minority groups". congress.gov. Library of Congress. Archived from the original on November 22, 2016. Retrieved 20 December 2016. ^ "Chinese Communist Party Subverts Democracies and Rights Abroad". The Epoch Times. September 10, 2009. Retrieved December 18, 2009. ^ "Editor's Note on Coverage of John Liu: Uncovering a hidden threat". September 10, 2009. ^ "John Liu and the United Front". The Epoch Times. Retrieved December 18, 2009. ^ Greenaway, Norma (August 3, 2010). "Liberals decry secrecy around CSIS report". Vancouver Sun. Archived from the original on August 5, 2010. Retrieved May 25, 2012. ^ "Chinese-Canadian leader laments spy agency allegations". Vancourier.com. July 29, 2010. Retrieved May 25, 2012. ^ a b Bethany Allen-Ebrahimian, The German Edition of the Falun Gong-Affiliated The Epoch Times Aligns with the Far Right, China File (September 23, 2017). ^ a b c "The Epoch Times Really, Really Loves The Trump Administration". BuzzFeed News. Retrieved October 22, 2018. ^ a b "A Letter to Our Readers Regarding BuzzFeed's Reporting About The Epoch Times". www.theepochtimes.com. October 23, 2018. Retrieved February 26, 2019. ^ a b "The Chinese Press Battles For Hearts And Minds Abroad"
^ "UFO Sightings on the Rise in China, With More Predicted"
^ "12 Million-Year-Old Vehicle Tracks Found in Stone, Claims Geologist"
^ ""Supernormal Abilities Developed Through Meditation: Dr. Dean Radin Discusses "". Archived from the original on October 11, 2016. Retrieved April 6, 2019. ^ "Mental Clarity During Near-Death Experiences Suggests Mind Exists Apart From Brain: Study"
^ "More Than 1,000 Scientists Dissent From Darwinism"
^ "The ‘Consensus’ on Climate Change"
^ To, James Jiann Hua (2014). Qiaowu: Extra-Territorial Policies for the Overseas Chinese. BRILL. p. 180. ISBN 9789004272286. ^ Herschensohn, Bruce (2006). Taiwan: The Threatened Democracy. WND Books. p. 99. ISBN 9780977898428. ^ "The Epoch Times Really, Really Loves The Trump Administration". BuzzFeed News. Retrieved January 26, 2019. ^ "Trump Said to Describe The Epoch Times as 'Most Credible Newspaper'". www.theepochtimes.com. April 16, 2018. Retrieved January 26, 2019. ^ Nakamura, David; Shih, Gerry (September 18, 2018). "White House reviews incident involving The Epoch Times photographer handing a folder to Trump". The Washington Post. Archived from the original on September 19, 2018. The photographer, identified by other photojournalists as Samira Bouaou, passed the purple-colored folder to Trump as he was walking out of the East Room on Sept. 12 after delivering remarks at a reception for the Congressional Medal of Honor Society. ^ "The Epoch Times Really, Really Loves The Trump Administration". BuzzFeed News. Retrieved February 26, 2019. ^ The Epoch Times Dec 26, 2004 (December 26, 2004). "Part 8: On How the Chinese Communist Party Is an Evil Cult". The Epoch Times. Retrieved December 18, 2009. ^ Gossett, Sherrie (June 15, 2005). "Independent Chinese Newspaper Bucks Communists". aim.org. Accuracy in Media. Retrieved October 19, 2013. ^ "Quitting the CCP". The Epoch Times. ^ "Paper denies representing Falun Gong". Religionnewsblog.com. Retrieved March 6, 2014. ^ University, Berkley Center for Religion, Peace and World Affairs at Georgetown. "David Ownby". berkleycenter.georgetown.edu. Retrieved March 2, 2019. ^ Ownby 2008, pp. vii–viii, 163, 221–3, 229. ^ To, James (December 2012). "Beijing's Policies for Managing Han and Ethnic-Minority Chinese Communities Abroad". Journal of Current Chinese Affairs. 41 (4): 183–221. doi:10.1177/186810261204100407. ^ Ng, Jason Q. (August 27, 2013). Blocked on Weibo: What Gets Suppressed on China's Version of Twitter (And Why). New Press. p. 127. ISBN 9781595588715. ^ Canada, Supreme Court of (January 1, 2001). "Supreme Court of Canada - SCC Case Information - Summary - 34781". www.scc-csc.ca. Retrieved March 2, 2019. ^ Ubertor.com, John Miller, The Journalism Doctor, Bewdley, Real Estate Website by. "Blog: Good journalism". www.thejournalismdoctor.ca. Retrieved March 2, 2019. ^ "Find a Recipient". The Governor General of Canada. Wikimedia Commons has media related to Epoch Times.